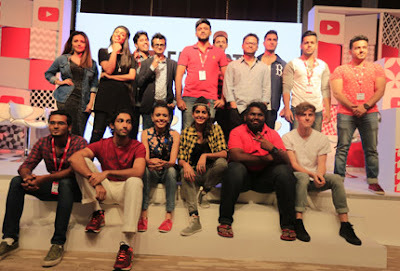 At a press conference on the eve of YouTube FanFest, YouTube announced that content partners Culture Machine, OML, Qyuki, and The Viral Fever (TVF) were set to launch four new original properties on YouTube. This announcement marks another milestone in the breakneck growth of the Indian YouTube creator community. comedy creators will launch their own comedy web series, featuring among others, YouTube comedians such as East India Comedy, Put Chutney and Kenny Sebastian, who are also starring in today’s YouTube FanFest. In the coming months, Culture Machine will be launching Beauty Hunt, a beauty/style-centric program, while OML will launch season 2 of its successful Comedy Hunt, the search for India’s next top comedy act. Qyuki will launch Jammin’, a show featuring Bollywood composers and YouTube music creators, while veteran web show creators TVF will be launching a search for the next generation of web series creators. In the South, we will also see a Tamil Comedy Hunt with Vision Time, a Telugu Comedy Hunt with ETV, and Katha, a Tamil/Telugu web series property, later in the year. The success of homegrown YouTube creators such as All India Bakchod, TVF, as well as the massive following of Indian-Canadian comedian Lilly Singh aka ||Superwoman||, has inspired thousands of young Indian creators to step forward to launch their own channels on YouTube. These aforementioned top creators, as well as some the fastest-growing independent creators in India, will be performing live at YouTube FanFest presented by Pepsi, Amazon India, Pantene and Clean & Clear, now in its third year in India. YouTube’s growth in India has been meteoric: while overall watchtime in India has grown by 80% YoY (with 55% of that watchtime on mobile) and the hours of video uploaded from India has increased at 90% YoY, content uploaded by India’s independent creators has risen especially quickly. For instance, watchtime of independent musicians grew over 92% YoY; comedy and entertainment grew 100% YoY; and beauty and fashion videos have grown over 138% YoY. Another notable area of watchtime growth came from the South, with Tamil and Telugu content seeing a 75% spike in YoY growth. YouTube FanFest is set to take center stage on Friday, March 18th 2016 at the NSCI Indoor Stadium in Mumbai. All general admission tickets were snapped up within one hours. For those who can’t make the live show, YouTube FanFest will be livestreamed at http://www.youtube.com/fanfest. Follow every moment at @youtubefanfest or follow the hashtag #YTFF on social media. YouTube™ is the world's most popular online video community allowing millions of people to discover, watch and share original videos. YouTube provides a forum for people to connect, inform and inspire others across the globe and acts as a distribution platform for original content creators and advertisers large and small. YouTube, LLC is based in San Bruno, Calif., and is a subsidiary of Google Inc.